The opening of Caffè&Caffè Al Santo takes place 20 years after the inauguration of Milani’s first “Caffè&Caffè”, and today has 9 coffee-shops that stand out for their innovative architectural style, but above all for the quality of the products and the passion for the world of coffee which you can scent and taste inside each and every one of them. We are located in the historic Piazza del Santo, the center of Paduan city life and a place of pilgrimage believers and tourists from all over the world that visit the Basilica of Saint Anthony (here we call it “Il Santo”), attracted by the architectural and artistic beauty that distinguish it and by the spirituality that surrounds it. 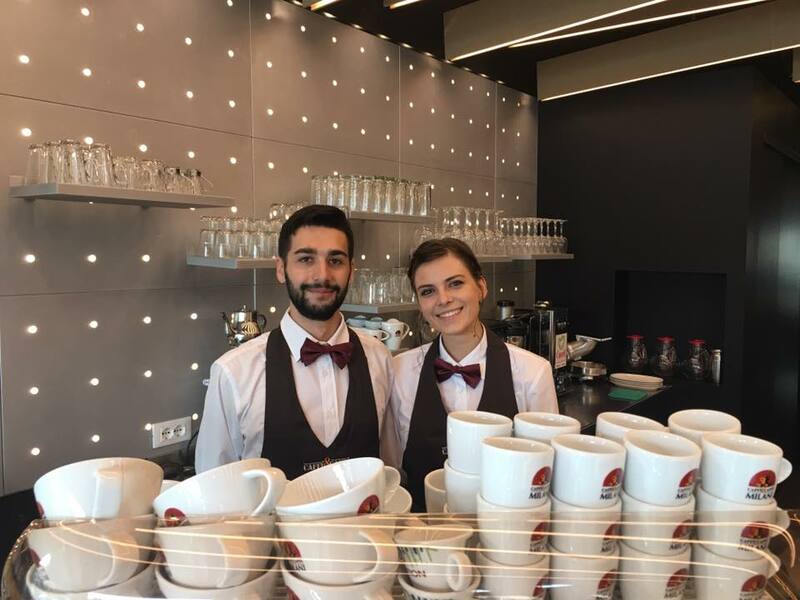 In front of its entrance, civic number 22, an historic coffee-shop reopens with a renovated look and menu that offers new and interesting taste experiences: Caffè&Caffè Al Santo of Caffè Milani. It is a coffee-shop where you can enjoy the classic Espresso experience quickly consumed standing at the bar, as most Italians do, and also where you can enjoy a tasty breakfast with croissants, cakes, sweets or have a snack at any hour, have lunch or conclude the day with a good aperitif. All in a young and welcoming environment, conducted by Alberto Calore, eager to share his knowledge about the world of coffee, a heritage that the new manager has acquired by attending numerous training courses at the Roasting establishment of Lipomo (Como). The coffee-shop is distinct by its clean and essential lines in which the contrast between the warm color of the wooden furniture and beams in the ceiling that continues with the Beige of the walls, and the metal of the counter and the back counter; the floor is black with aluminum strips. The rainbow of colors that immediately catches the eye is found on the back wall, where 11 packages of different coffee proposals surmounted by an unusual headboard that asks ” Which is your coffee?” Each proposal is characterized by the name of the product, and some notes on the aroma it offers in the cup and the particular fusion with a singular personality. therefore, the balanced aroma and soft taste of the classic blend of Caffè Milani “Original Blend” is suggested to those who love the traditional taste; the floral scents and pleasant taste of a Jamaica Blue Mountain is recommended for the thinkers; the floral taste of an Indonesia Kopi Luwak to the eccentrics, while an India with a strong and persistent aroma to the rationals. And the combinations are still numerous. The various origins of the Puro line (coffee from a particular region or country of production, 100% Arabica) make it possible to travel in the tropical zone, among producers from all over the world discovering the different taste declinations of each origin: a journey that amazes and fascinates everyone. The bar counter is surmounted by an elegant espresso machine; on the back counter there are four coffee grinders dedicated respectively to the Caffè&Caffè blend, made specifically for our coffee shops, a blend with a “round” taste and pleasing to the palate; the new Action Espresso Bio blend, made with 100% Arabica coffee, all grown without the use of chemicals and pesticides, characterized by a slight acidity with hints of flowers and fresh fruit; to the decaffeinated Cuoril, dedicated to those who love themselves and want to enjoy at any time of day the full taste of the beverage that is extremely loved by Italians, last but not least a single origin from the Puro line, which will change every two weeks. At the opening we will have the single origin Ethiopian coming from the Sidamo region, characterized by a remarkable aroma and a spicy taste; an unusual coffee that knows how to amaze and makes you want to come back in order to discover the particularities of new origins. Continuing along the counter you will find cake domes filled with croissants, cakes and desserts, along with an offer of hot and cold plates that changes according to the seasons. At the back there’s a display with colored packaging (each color is linked to a coffee) of a blend or one of the eleven single origin of the Puro line: Brazil, Ethiopia, Guatemala, Papua, Jamaica, Kenya, Puerto Rico, Indonesia, India, Colombia and Galapagos. All are available in 200 gram bags of grains (those who wish to grind them at the time of purchase can do so), and a small size package of 42 grams (for a “taste” or an particular desire) and the 125 grams package tin of ground coffee, and finally there is the Nespresso compatible capsules. There are 12 seats inside the internal lounge and about fifty outside. where you can enjoy an espresso, a cappuccino, or a coffee made with French press: a “coffee maker” created in 1852 by the French madame Vassieux, who uses a plunger system to obtain what could be called an ” tisane coffee “: it is a longer and lighter espresso drink, but pleasantly aromatic, which goes well with a prolonged rest, preferably with some sweet foods. “For the new opening we have chosen an important date for the sector” – says Pierluigi Milani, owner of the Roasting establishment -: the first of October is in fact the International Coffee Day, which this year is dedicated to women, which Caffè Milani is always attentive and grateful for their dedication and great importance in the world of quality coffee.” Last year, the Roasting establishment celebrated its 80 years of activity by inaugurating the new renovated and enlarged location in Lipomo (Como). where you can find the Altascuola Coffee Training which offers a complete program of courses for bartenders and conventions aimed for coffee lovers who want to learn and deepen their knowledge about the beverage. Another focal point is the Caffè Milani Expo, an experiential space dedicated to the formation and diffusion of the coffee culture that proposes a full journey right from the plant to cup that really surprises for its completeness and the presence of numerous rare and valuable pieces. They place it among the major coffee museums. The coffee culture together with lots of enthusiasm are the “engine” of the new Caffè & Caffè Al Santo that has in store interesting news, and above all, a great desire to spread the knowledge of coffee. And, who knows, maybe one day you will go to Al Santo to choose the most suitable coffee to conclude a dinner with friends or relatives, for example with an intense blend if it’s based on meat, or a single origin sweet and citrus if it’s based on fish, finally giving coffee the importance and the attention it deserves.